One of the great stories of the Dodger’s 2018 season has been the resurgence of Matt Kemp. The Bison has always held a special place in most of the Dodger fan’s hearts. Kemp has been a homegrown product, graduate of that great 2006 draft class he grew to superstar status during the peak of his career. He’s brought a blend of football mentality and raw power and speed unlike any player in recent memory. He’s a big body guy that can hit the ball super far. Throughout his first stint with the Dodgers he struck fear into opposing team’s pitchers. The guy is a stud. Unfortunately chronic hamstring and leg injuries derailed his career for a couple of years. The Dodgers reacquired him this winter in one of the best trades of the offseason. Many expected the Dodgers to move him and some thought that he would not be around long enough to even make the opening day squad. Well Kemp proved the naysayers wrong by not only making the opening day roster but going on to have a solid season. He slashed .290/.338/.481 with 21 home runs and a 121 OPS+. Not only that he’s been a plus defender in the outfield. For someone who was not supposed to be with the team past spring training, that is a great campaign. Kemp was rewarded by being voted to the National League all-star team as a starting outfielder. Kemp was one of the league’s leading vote getters. That was a testament to his strong season. However the Dodgers played him less and less down the stretch, to the ire of some fans. I can understand the frustration from fans. The question became why is he not getting as much playing time as he was in the first half of the season? At first I thought it was because he simply wasn’t hitting as much as he was during his fantastic first half. But looking closer at the numbers that seems to be false. While Kemp did struggle through August (.214, .577 OPS), he made up for that by having a terrific month of September (.339, .922 OPS). Looking even closer we see that Kemp was hitting well down the stretch. As a matter of fact Kemp batted .348 (16 for 46) during the last 28 days of the season. Not only that, but he continued to be one of the best hitters with runners on base. Kemp posted a .908 OPS with runners on base and batted .353 with runners in scoring position. He’s been a beast with RISP. For the Kemp lovers (I am one of them), I can come up with only two possible explanations. For whatever reason his power dwindled. 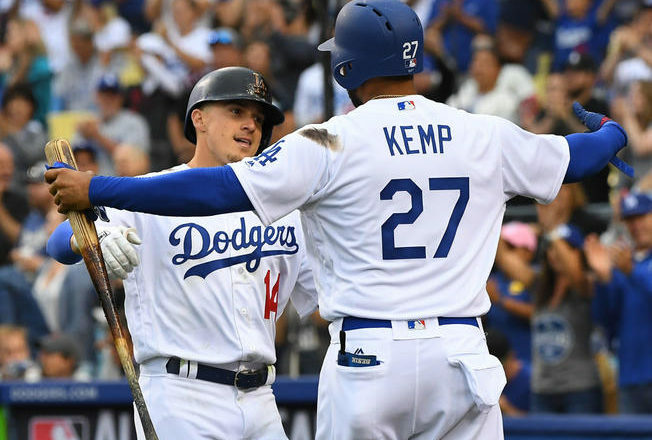 Kemp hit 15 home runs before the all-star break, with 60 runs driven in. In the second half he swatted just six and drove in just 25 runs. Considering power is a big part of his overall game that presented a problem for the Dodgers. Maybe age and a long season were the probable causes? If Kemp isn’t hitting home runs and not driving in as many runs as he did before the second half, and that could probably help explain why he garnered less and less playing time. Possibly the most probable explanation is that Kemp has almost no plate discipline. Basically he just doesn’t draw enough walks. Kemp has always been an aggressive hitter. Walks are just not part of his game either, but Kemp drew just 36 walks while striking out 115 times. His BB% was just 7.1% in 2018. The fact that his OBP was as high as it was is a testament to his power and line drive stroke. The Dodgers primary offensive strategy (other than hitting a lot of home runs) has always been to draw walks. The Dodgers are one of the most patient hitting teams in the majors. The Dodgers don’t swing at balls, which is a great strategy for making the opposing pitcher work. The more pitches the opposing pitchers throw, the more runners the Dodgers get on base and the more runs they score. Unfortunately Kemp’s lack of discipline just doesn’t fit into that overall game plan. I don’t expect for Kemp to get much playing time the rest of the way. He’ll get an occasional start against left handers perhaps, but guys like Joc Pederson will get more playing time because they fit into more with what the Dodgers are trying to do offensively. Maybe the Dodgers can work with Kemp to increase his plate discipline and get him to see more pitches? Perhaps it’s not too late for Kemp to increase his batting eye and be less aggressive. 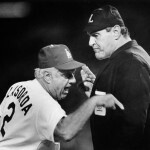 I’m sure the Dodger coaching staff can work with him in some way. However I don’t expect for Kemp to radically change his game, nor the Dodgers to change theirs. For the time being Kemp will be a part time player, but maybe the Dodgers can teach an old dog some new tricks. I think what you are saying in a nutshell is Matt doesn’t hit enough HRs and does not walk enough. I understand that is what the geeks want in the FO but it is yet to be determined is that is enough. Matt has lead the league a number of weeks in RISP. His average has stayed good for the year and he is not that far of the first half, considering he has 130 less abs. I think they are not in favor of putting Matt in a position to succeed. Why? I do not know. I have called it favoritism, lack of a good manager, the FO, among other things. Bottom line is Matt is being hurt for no reason that those in the know have cared to enlighten us with. It is very sad and it shows that they will do stuff like this to any player. Who is next? Kershaw? Kershaw has the opportunity to opt out after this season and comparing a pitcher to a position player just does not work. Kershaw has also been injured a lot over the last 3 years, has chronic back problems and a lot of innings on that arm. Matt has been pretty healthy this year and other than the short slump he endured, he has been pretty consistent. But I do not in any way consider it a conspiracy to keep a good player off the field. Nor do I think it is disrespect to Matt. I think it has more to do with their philosophy than anything else. To Matt’s credit, he has not complained or become a clubhouse cancer like he was accused of being before he was traded, quite the contrary, he has been the consummate team mate and a huge cheer leader from the bench, and he plays hard when he is in there. Against the Brewers he should play more. Well I’m saying that his power dipped a bit in the second half. Which may have been a deciding factor. Also his plate discipline doesn’t seem to be in their game plan. I’m not agreeing with it. I love Kemp, and I would play him more often. Unfortunately the FO sees things differently. He’ll still get some playing time, but not every game, or so it looks. What a lot of people here fail to realize, and some refuse to acknowledge is that Matt, prior to his injury in 2012 was probably the best CF in the NL. When he ran into the wall in Coors field chasing a fly ball that had been crushed, he was going full blast. I know, I was watching that game. He jumped, hit the wall with his left shoulder, and it was right there where the wall has some screening, he badly injured that left shoulder. At the time, he was leading the league in hitting and had 20 homers. He went on the DL, did some re-hab at both Albuquerque and Rancho, and came back. He was obviously not the same player. He only hit 3 homers the rest of the year, and his batting average went all the way down to .303. In 2013, after he had 2 major surgeries over the off season, he played in only 73 games, and he clearly was not the same player. He injured his ankle and he had hammy problems that year. He hit .270 and had 6 homers. In 2014, he started off slow. But he rebounded the 2nd half and ended up hitting .267, with 25 home runs. He was by far the Dodgers best hitter down the stretch. He has been a decent playoff hitter. a .253 average with 3 homers in 20 at bats. But close to .300 in the LCS. We all know he was traded over the winter after the 2014 season. Over the next 3 years his average was around .270, and he averaged 23 homers a year with 90 RBI’s. He was very close to those stats this year in his return hitting .290 with 21 dingers and 86 ribbies, which led the team. I think he would have matched them had he played more. I also think the power outage was more due to lack of playing time than his aggressive nature at the plate. But that’s just me. I also think him getting used to being a platoon player had a lot to do with it. He actually went to Chase Utley to get advice on how to handle that. Most true power hitters strike out a lot. Pederson, until this year, always fit that pattern. Bellinger has been striking out a lot. What does not compute is that a guy like Taylor, who is not a power hitter, struck out more than anyone in the NL. Pederson was hitting leadoff homers against righty’s so Roberts stuck him in there in the leadoff role mainly because the guy who excelled at that last year, Taylor, was so bad in it this year. But Kemp hits RHP better than he does left. So it really makes little sense to start Joc over him. Joc of course, does not hit lefty’s at all. Problem is, neither does Puig and Kemp nor Pederson are good enough to cover CF, so therein lies the dilemma. I doubt Matt will still be with the team next year. I think FAZ will re-double his efforts to move him this offseason even if it means eating some salary. Going to an AL squad where he could be the DH might be Matt’s salvation in the game. It is a shame that such a talented player had his career derailed by Coors Field. Just think how good he was when that happened. Not to worry Pack. Brewers just announced their starters for games 1-2-3. 2 lefty’s starting game 1&2. Gonzalez in game 1 and Miley in game 2. Chacin will start game 3. Chacin was the starter when the Dodgers beat the Brewers 21-5. They hit 3 homers off him that game. Gonzalez is 3-0 against the Dodgers the last 4 seasons. But he is also 10-11 this year with an ERA north of 4 and has not faced LA this year. It means Kemp will at least start games 1&2. Only announced starter for Dodgers is Kershaw so far. Still deciding between Buehler and Ryu for games 2 & 3. Ryu has been nails in LA, so I am thinking they will save him for that game. Rosters should be set sometime tomorrow. Dodgers first free agent signing is another young Cuban. This time a 17 year old pitcher. IT MIGHT BE WRONG BE IN THE PLAY OFF ..MATT SEAM S TO COME UP WITH A COUPLE OF DOUBLES . SOME SINGLES A LOT MORE THEN BELLINGER..